Today was the sixth day of Chesed Mission. A day that showed us that we should be thankful for those who do the most difficult jobs of all. Our first stop on our quest for chesed was Aleh. 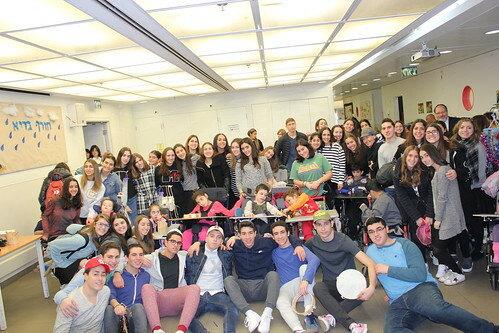 Aleh is an organization that cares for children with severe mental and physical disabilities. Aleh helps these children overcome their challenges and achieve the highest quality of life as possible. They give them the opportunity to be like regular children by giving them the ability to climb on a jungle gym, splash in a pool, finger paint, dance, sing, and more. What was incredible was that we were able to communicate with these children through our hearts. We learned that words and verbal expression aren't the only means of communication. The devotion and enthusiasm of Aleh's staff towards the children amazed us all. We were divided into groups of 10 and sent to separate classes. Each group was able to participate in the children's morning routine. Afterwards we all gathered in one room and danced and sang, it was truly beautiful. Our next stop, was an army base. There we were able to learn more about their K-9 unit. We were fortunate to witness a black labrador's search for weaponry and a german shepard attack the arm of his trainer. This was of course all just a demonstration. They led us through the cages - some of us were frightened and some were in awe. Afterwards we had the opportunity to meet soldiers who were on the base and hear about their experiences. We are so thankful for these soldiers' bravery. The fact that they risk their lives everyday so that we can practice our religion freely and continue the legacy of our forefathers through the State of Israel. Meshi was the next stop on our quest. Meshi is a rehabilition and educational center for children with disabilities. We adored the children's excitement and all around cuteness. We planted flowers with them for the next holiday which is Tu B'Shvat. We had an amazing time and their teachers were all helpful with translations and made the kids even happier. After having a nice lunch at an outdoor mall nearby, we went to Susan's House (not Susan Franco like one might've thought). Susan's House is an organization that takes in troubled teens and gives them an alternate use of their time: to harvest their emotions into something positive like artwork and build up their self esteem. We were fortunate to witness the process in which the teens created glass and ceramic keychains, jewelry, bowls, and plates. Afterwards, we bought the beautiful crafts that these teens have created before our very eyes. Chesed Mission establishes the feeling of אחדות within each and every one of us. We're able to connect with all the wonderful individuals who we interact with. We stay and entertain for an hour or two, but the workers at Aleh and Meshi, the beautiful children they care for, the IDF soldiers, and the firemen of the Beit Shemesh station continue 365 days a year. They are the ones who do the most difficult jobs of all.